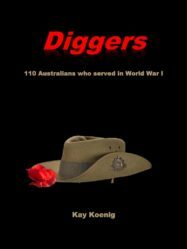 These are the 126 men and 2 women featured in the book Diggers. They enlisted with the Australia Imperial Force to fight in World War I. One hundred and ten served overseas in Gallipoli, the Middle East and on the Western Front.